In a region with 3,700 miles of shoreline, the impact of climate change on coastal areas from rising sea levels and more intense flooding presents major challenges to infrastructure and the health and safety of residents. Increased funding will be needed to rebuild to higher standards of resilience and invest in protective measures to keep water out. While we cannot wall off the entire shoreline, we can help communities determine how and where to spend limited dollars to protect the most people and critical infrastructure. A phased approach over the long term will be required to reduce and ultimately remove development from the highest-risk flood zones. Other measures such as elevating buildings, changing zoning codes to account for sea-level rise and flood risk, and buying out the owners of properties most at risk will all be important tools in making this transition. 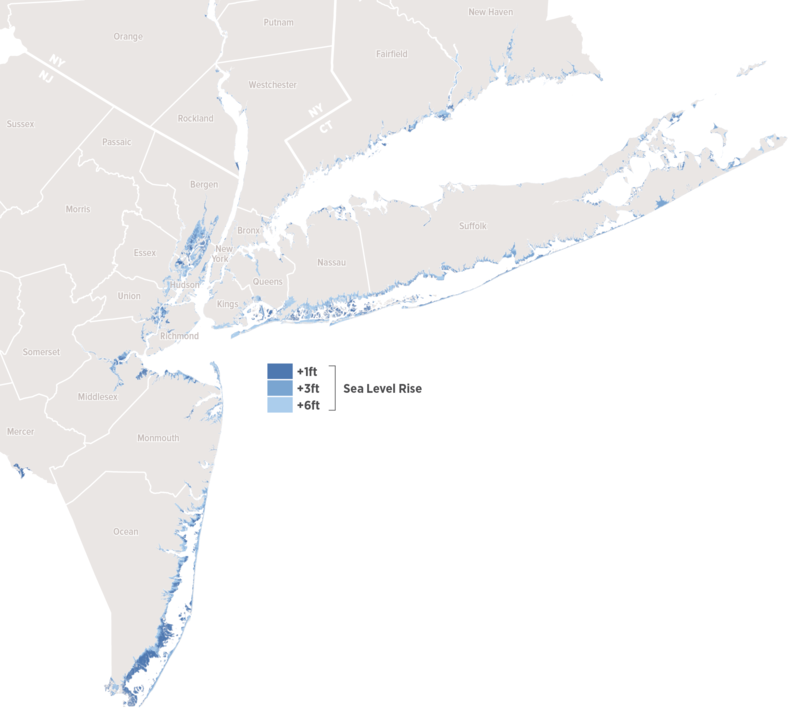 Superstorm Sandy galvanized the region to plan for coastal storm surges. A variety of adaptation plans and projects are underway, but few grapple with the difficult reality of sea-level rise and the permanent inundation it will bring to the lowest-lying areas. Communities that have settled on barrier beaches, back bays, and river floodplains are at particular risk, and within a few decades will need to be relocated. A small number of communities in New Jersey and on Staten Island and the south shore of Long Island have already begun to encourage residents to sell their property and move away. Many more communities need to plan for this transition—in the New Jersey Meadowlands, Long Island’s south shore, and the iconic Jersey Shore—and will need technical assistance to do it right. A further challenge is programs to buy out homeowners: while effective in the early stages of transition, buy-out programs will not be financially sustainable as currently conceived when entire communities need to be relocated. Implementing this transition is imperative for our survival, but will involve difficult decisions and actions, as these shoreline areas contain active communities with homes, businesses, and essential services, many of which must be relocated. As sea levels rise and land becomes permanently inundated, retreat is inevitable, whether it is well-managed or left to market forces. We can, however, ease climate adaptation by phasing in measures over time, curbing new development, and providing strong incentives and support for people to relocate. Using federal flood maps, repetitive loss data, and storm surge and sea-level rise models, municipalities should comprehensively analyze which areas are at greatest risk. There are numerous free, user-friendly, web-based tools (such as the Coastal Resilience tools from The Nature Conservancy and Rutgers University, and Climate Central’s Surging Seas tools) along with government, universities, and nonprofit organizations that can provide support. Additionally, a peer-to-peer network of municipalities like the New York Region Climate Action Network allows for the exchange of ideas and best practices concerning long-term adaptation. High-quality and accessible data is critical for informing which combination of adaptation strategies is best-suited for the community. Once the areas at greatest risk are identified, a moratorium on new development in these places should be put into effect. It is the responsibility of the government (federal, state, and local) to ensure additional residents will not be put in harm’s way. Municipalities with high-risk coastal areas should comprehensively overhaul local zoning and building codes to reflect the realities of climate change and its consequences. Zoning regulations should be updated to discourage growth in high flood-risk areas and encourage growth and redevelopment in low flood-risk areas. Building codes in all waterfront communities should be adapted to make any future development or redevelopment in lower-risk flood zones more resilient. Although a moratorium combined with zoning and building code updates will help guide new development in the right direction, plans will be needed to adapt existing development in flood zones. Long-term adaptation plans that set goals for waterfront areas and consider the many adaptation tools will allow municipalities to phase in different adaptation steps. In the short term, structural measures like seawalls, bulkheads, and pumps may be the best option; in the long term, managed retreat from the waterfront could be the ultimate step. Municipalities should consider integrating these plans in upland areas by, for example, rezoning higher ground for higher density, where appropriate. The plan should lay out the transition across phases that align with increasing climate risks. If the estimates of climate change and sea level rise are true, we have vastly underestimated the massive effort it will take to hold back the sea. In the short term, an increasing number of municipalities would acknowledge the areas at greatest risk of flooding and destruction, and future development there would cease. Over time, building codes and zoning regulations would be updated, discouraging growth in the flood zone and encouraging resilient growth on lower-risk land as municipalities develop phased adaptation plans. Enhanced buyout programs and reliable adaptation funding would allow communities to make the transition, and much of the waterfront edge would be returned to nature to serve as a natural buffer from floods. Benchmarks of success would include a robust network of municipalities sharing challenges, best practices, and long-term visions across a regional network by 2020. Development moratoriums in high-risk zones of lower-density waterfront municipalities would also be established by then. By 2030, all coastal municipalities would have enacted building-code and zoning regulation changes that permanently ended risky development in flood zones, and would be in the process of implementing their phased, long-term adaptation plans. Improved and well-funded buyout programs would have returned to nature all unprotected areas subject to permanent flooding from one foot of sea-level rise by 2040, and three feet of sea-level rise by 2075. Adapting our municipalities for long-term and permanent flooding will require significant public investment, and could ultimately result in lost tax revenue from lucrative waterfront properties. National flood insurance rates will begin to rise over the coming years, perhaps making affordability along the coast even more difficult and buyouts a more attractive option. All adaptation tools—from walls and pumps to buyouts—will require a large and stable source of funding. In the long run, some costs could be offset by a reduced need for municipal services (evacuation, closed roadways, repairs to infrastructure) and personal expenditures (flooding repairs, mold, loss of workdays, health issues). Lost tax revenues can be restored by developing lower-risk areas, if the community has such land available. The high cost of adapting and retreating from the waterfront underscores the importance of developing Adaptation Trust Funds.